The next meetings of the Scientific and Steering Committees will be held in Cagliari on October 2-3 2014. The state of the art on the Investments, as well as the financial progress will be monitored by the experts in charge of the project. Plural will contribute with the updating of the communication plan, including the public on line survey on the environmental state of Thyrrenian Sea, to be held in the next months. PLURAL European Study Centre has finalised the Catalogue of Agro food products and artistic handicraft" forseen by Marakanda project. The book, available on the project web site marakanda.eu is a collection of pictures and materials from partner territories of Italy, Greece, Cyprus, Egypt, Lebanon and Spain. The first meeting of the Steering Committee of UCAT Network project was held in Livourne on 30 July 2014; the project, financed by "Italy France Maritime 2007 2013" cross border Programme, is the follow up of the previous UCAT initiative about the Union of coastal cities. The present project is focused on infrastructural Investments addressed to the creation of an Observatory on urban spaces within their relation with services for SMEs and citizens. The next meeting is foreseen for October 2014 in Lucca, during the "Dire & Fare" event dedicated to public administrations. Mr Andrea Luca Cidda (Genoa, Liguria) is new the new first level controller of Plural European Study Centre for SICOMAR project,. The selection was performed according to the web based procedure provided by the Italy France Maritime cross border Programme 2007-2013! We welcome mr. Cidda and we wish to thanks all other controllers who gave us their availability for Sicomar project! A meeting of the Steering Committee and a Studt Visit to city markets were organized by the Municipality of Florence (Italy), supported by Plural European Study Centre. Communication activities and the annual plan for cross border experimentation were illustrated by Plural's project manager. Partners from Lebanon, Spain, Greece, Italy and Cyprus joined the event. Next Steering Committee meeting in Cyprus, 16-18 May 2014. Get in touch! SICOMAR project, promoted by Tuscany Region with the participation of Plural European Study Centre successfully started with the Official Kick Off meeting in Florence, on October 17 2013. Two round tables, on the themes of enviromental monitoring and investments on the cross border marine area were developed at the presence of relevant Italian and French stakeholders at National and EU level. Following MOMAR project, SICOMAR is intended to consolidate an integrate sea monitoring system for the 2013-2015 period within the framework of Italy France Maritime Programme. 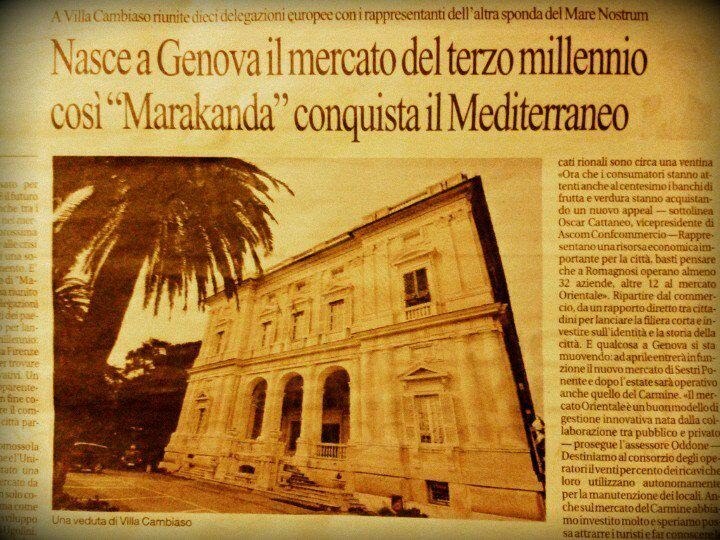 A thematic workshop, a meeting of the Steering Committee, a study visit to city historical markets of Genoa: this is the agenda of the Marakanda project (ENPI CBC Med Basin Programme) Joint Event held on 27 and 28 February 2013. EU Central Market project and Urbact Markets projects were hosted by the University of Genoa and the Municipality of Genoa. Plural European Study Centre presented communication strategies and cbc joint ideas to promote Marakanda project. Thanks to the partners from Italy, Spain, Greece, Cyprus, Egypt and Lebanon!